I have a new website, please take a look! Then I blended them in Photoshop and used a layer mask to omit the central area of the longer exposure to ensure the subject was sharp. Seems to have turned out reasonably well. Any thoughts? 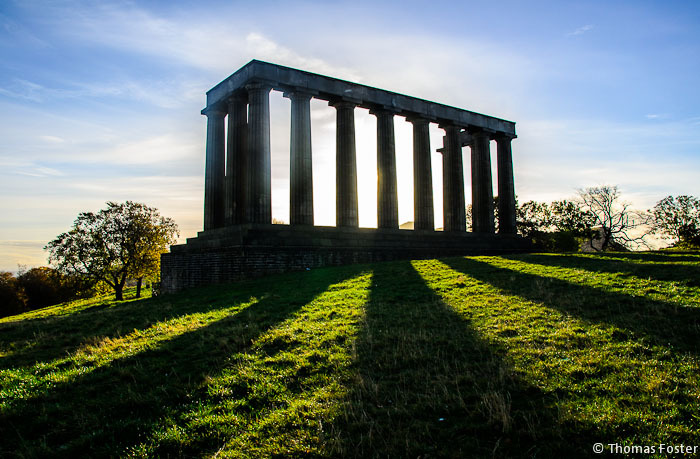 Calton Hill (Edinburgh) is full of great photo opportunities and looks great any time of day. I’ve taken quite a few photos there in the evening and got some nice sunsets but it occurred to me that I had never been there at sunrise before. 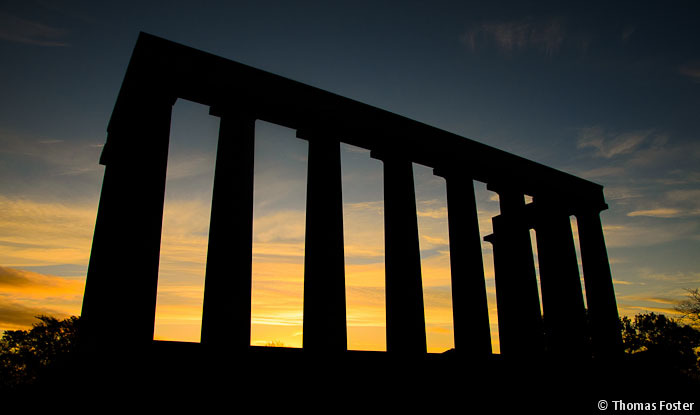 I set out at 7:15am today to remedy this and got to Calton Hill just before 8:00am (a few minutes before sunrise). It was actually a while later though before I actually saw much light as the Salisbury Crags do a good job of shielding Calton Hill from the early light. I quite liked this silhouette but I felt that the Monument still had more to offer as the light developed. However, my fingers were rapidly losing all sensation in the biting cold and so I felt I would come back later, after seeing what else I could find. I went round the back of the monument and the light was just beginning to stream through the trees. I didn’t want to miss this one! 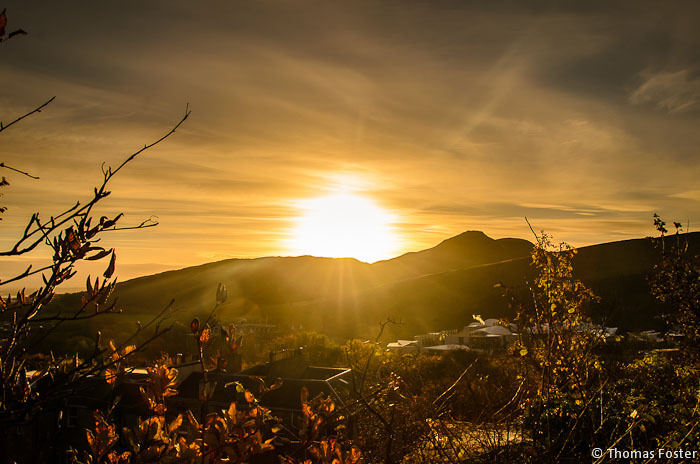 The sun was this point nearly appearing above the top of the Crags and so I headed to the Eastern side of the Crags to look out at Arthur’s Seat, Holyrood Palace and the Parliament. This one turned out better than I was expecting actually because the sun was dazzling and I found it difficult to be entirely sure the photo was composed properly! I think the Autumn leaves compliment the colours of the sunrise quite nicely. I decided to head back to the monument as things were rapidly brightening up now. I unfortunately got there just as a coach full of tourists arrived and they prevented me getting a clean photo for a while. I feel it was worth the wait though, I really like the colours and the shadows of the columns on the grass. Deciding that I had pretty much reached the limit of my ability to endure the cold, I decided to head home. 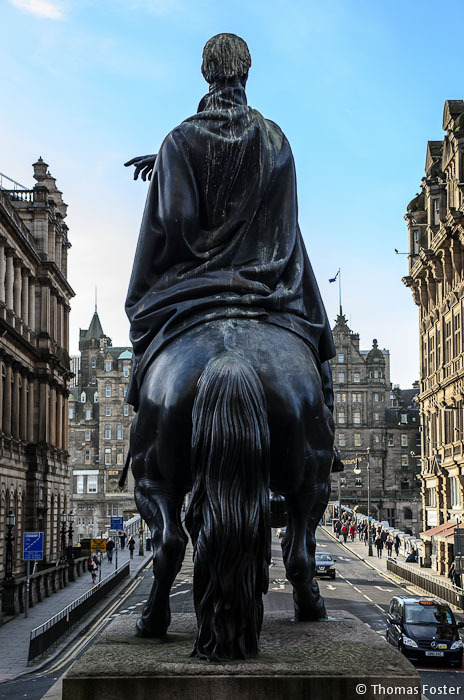 I couldn’t resist getting a picture of the Duke of Wellington statue at the end of North Bridge however. A quick hop over a gate rewarded me with a picture from a slightly different angle, looking up the Bridges from behind the statue. What do you think? I was originally planning on heading down towards Leith for a few more photos but decided to leave that for another day. Hopefully the clear skies will hold out, or maybe some dramatic clouds/fog would be nice! I know that this is one of those contentious topics so I appreciate some won’t agree with me! I used to shoot JPEG, since trying RAW out one day I have never gone back and have taken thousands of photos in RAW since. It has many benefits in my eyes, especially if you want more flexibility in editing the image afterwards or the image is tricky to capture in some way (perhaps due to range of exposure). 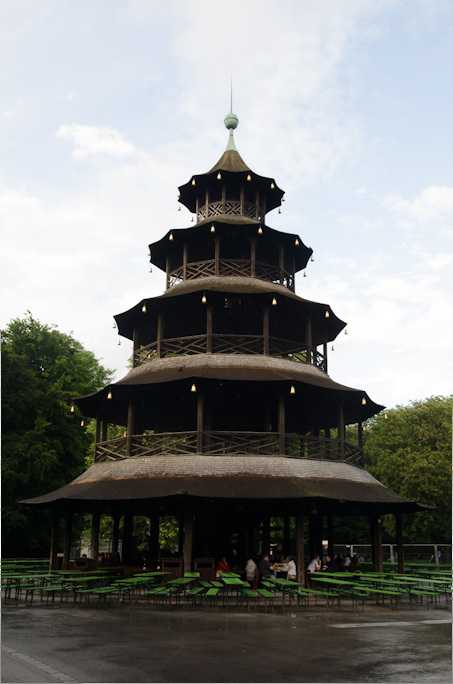 For example in the image below (which is the Chinesischer Turm in the Englischer Garten in Munich), the sky is overexposed and initially the image is reasonably bland. The sky is looking much more interesting now and both images look reasonably similar, although I feel that the colours on the RAW image are nicer (the JPEG looks a bit washed out to me). Besides the difference in the colour, the JPEG crop shows much more obvious banding in the sky (particularly on the bottom right of this crop), the clouds also look very poor in comparison to the RAW crop. I also noticed artefacts around the sky/tower boundary on the JPEG crop and these were not present on the RAW crop. 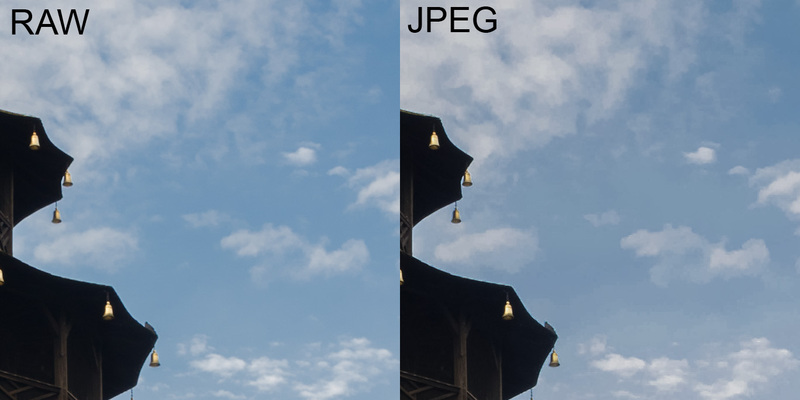 If JPEG works for you, fine, it’s just that there is no real reason not to shoot RAW. 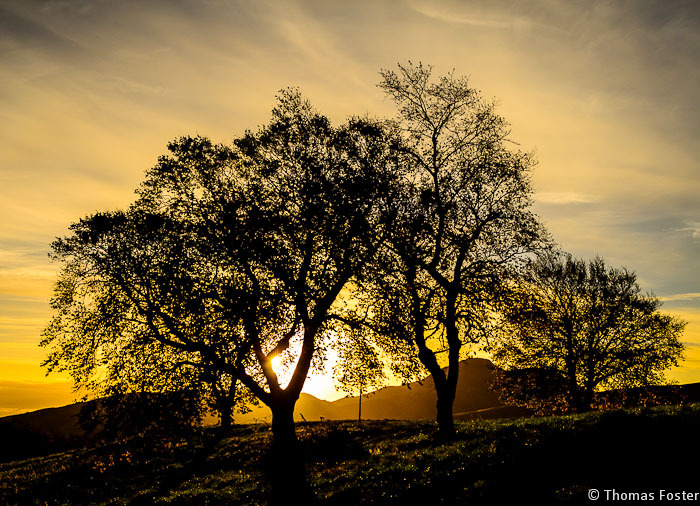 There is additional detail in the images which is great for digital manipulation of images (which is obviously a large part of modern digital photography) and handy if an area is under or overexposed. 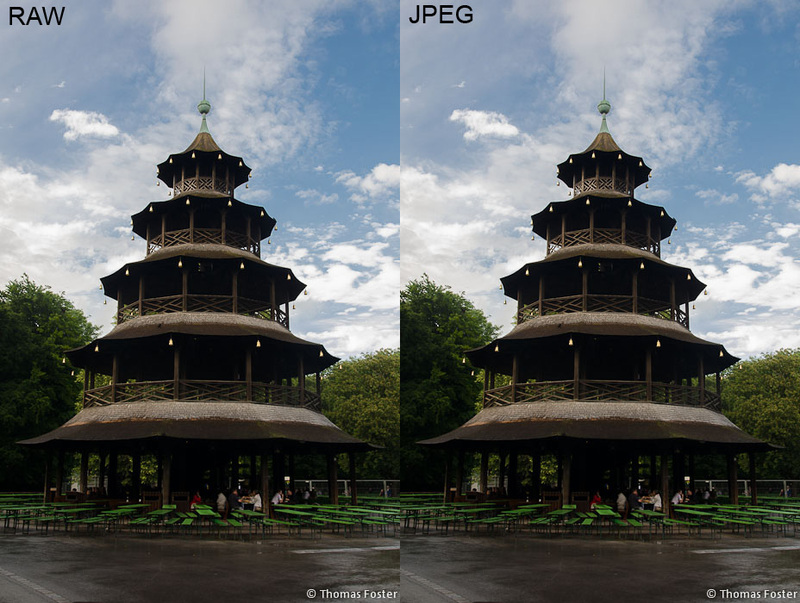 Of course file size might be an issue as here the RAW file is around 2 times the size of the JPEG (this will vary). However, with storage space being so cheap nowadays, this shouldn’t be too much of a stumbling block. If you don’t already shoot RAW then I would seriously recommend at least trying it out to see how you get on! What do you think? Do you shoot RAW or JPEG? Something I didn’t cover here was 14bit vs 12 bit RAW…do you think the 14bit makes a difference?